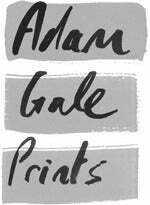 Adam Gale is an illustrator and printmaker. He graduated from Liverpool School of Art in 1999. Having spent 10 years working in London but originally from the North East, he currently lives in Birmingham. Working mainly with the screenprinting process he has a particular interest in the layering of colour and form this medium provides. The subject matter often reflects a fascination with the natural world, as seen from the slightly distant perspective of a life long city dweller. All screen prints on this site are designed and printed by hand by the artist.